Kenya’s main opposition leader, Raila Odinga, has declared himself the “people’s president” at a controversial “swearing-in” ceremony in the capital. Thousands of his supporters attended the event, despite a government warning that it amounted to treason. The authorities shut down TV stations to prevent live coverage of the event. President Uhuru Kenyatta was sworn in for a second term last November. He won an election re-run in October, but Mr Odinga boycotted it. Elections were first held in August but the courts ordered a re-run, saying Mr Kenyatta’s victory was marred by irregularities. Holding a Bible in his right hand at a park in Nairobi, Mr Odinga declared that he was answering to a “high[er] calling to assume the office of the people’s president of the Republic of Kenya”. 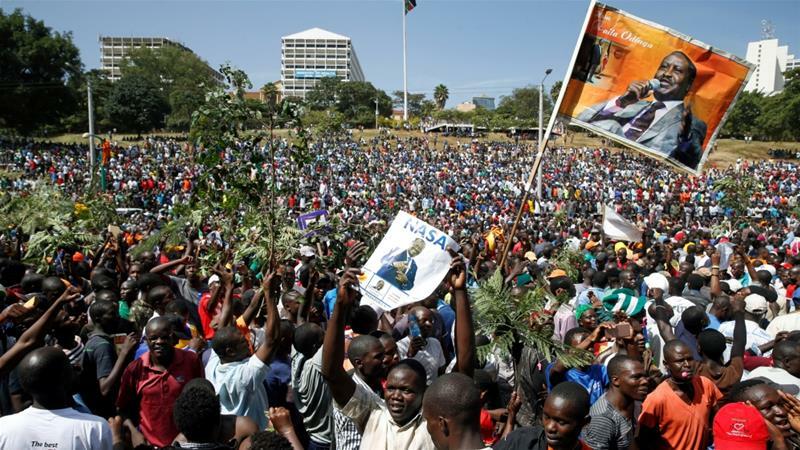 People had had enough of election rigging and the event was a step towards establishing a proper democracy in the East African state, Mr Odinga told a cheering crowd. Speaking earlier to Kenyan broadcaster KTN, Mr Odinga said his “swearing-in” was intended to “show the world that what we are doing is legal, constitutional and not something you can remotely describe as a coup”. It was a public relations stunt that ended in disappointment for many opposition supporters, says the BBC’s Alastair Leithead in Nairobi. Mr Odinga turned up for just 20 minutes. He signed a statement, swore an oath and left the stage, leaving his supporters wondering why it was such a low-key affair, he adds. His deputy, Kalonzo Musyoka, was not at the event, and Mr Odinga said Mr Musyoka would be “sworn-in” at a later date. However, his absence suggested there were divisions in Mr Odinga’s National Super Alliance, our correspondent says. One of them, Larry Oyugi, said there was nothing illegal about Tuesday’s event: “We have warned the police enough and we are also going as per the constitution. The constitution of Kenya, article one, allows all Kenyans to exercise their power directly. Police allowed the event to take place, despite warning earlier that they would prevent it from going ahead.